Awesome post, Shnugi! 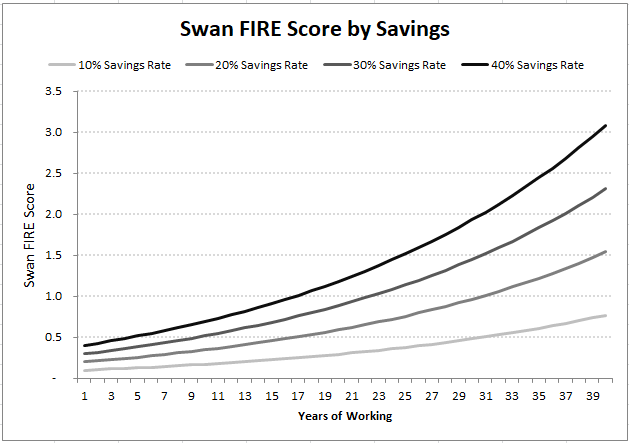 I love the benchmarks to various savings rates. Yes, 2008 definitely took a toll on my FIRE Prowess score…it was actually negative for the year! Ouch. 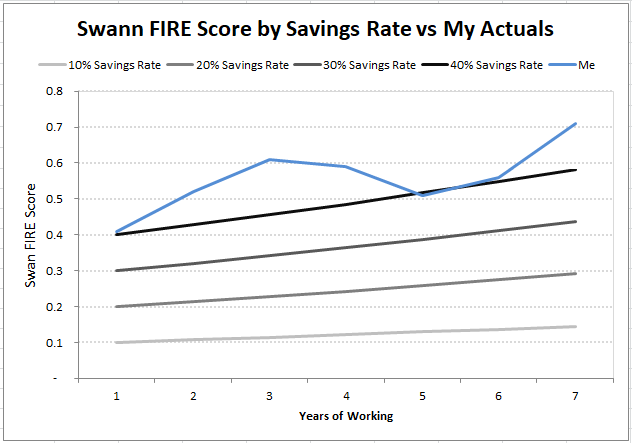 But my 5-year rolling FIRE Prowess score shows the more smoothing effect of market performance. And that is exactly why I’m a buy and hold investor (100% in the stock market). Over the long term stocks have the best performance…just more of a bumpy ride. Keep up the great work. I hope you enjoy tracking your FIRE Prowess score as much as I do! Thanks for joining the “chain gang”. Thanks for starting up a great topic! Cool, Shnugi adds a nice new element to the discussion with his awesome “theortical” FIRE Score chart! First one to a score of 300% wins! Congrats on great performance. Thanks for joining “The Chain”, you’re officially in as Link #4! Thanks I tried to add a little new spin on it, since you and Green Swan already did a great job! Will do! Sorry I took a week off. Wow you are doing awesome!!! I’ll have to jump on this and join in. Thanks for sharing!! !